$45.88 UTG Recon Flex KeyMod Bipod Aircraft Aluminum Matte Black Center Height 5.7"-8"
$44.89 UTG Recon Flex M-LOK Bipod Aircraft Aluminum Matte Black Center Height 5.7"-8"
Buy: $23.95 UTG Tactical Rifle Single Point Bungee Sling QD Swivel Adjustable 42" to 58"
$46.95 UTG TL-BP01 Rifle Tactical Aluminum Heavy Duty Recon 360 Bipod 6.69"-9.12"
$49.95 UTG TL-BP03 Heavy Duty Recon 360 Bipod Center Height Adjustable 8.12"-11.97"
Buy: $25.99 UTG Tactical Rubber Armored Full Metal QD Bipod Picatinny Mount Ht. 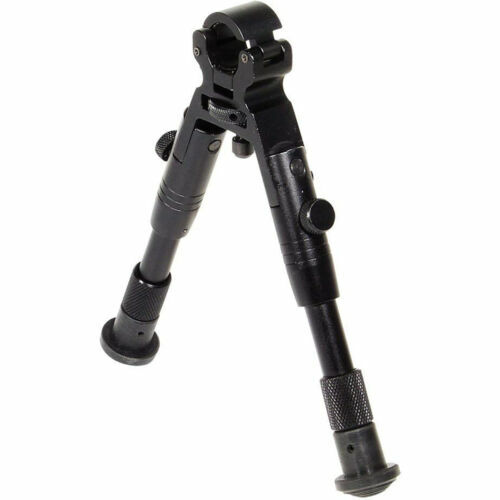 6.0"- 8.5"
Buy: $26.31 UTG Tactical OP Bipod, Rubber Feet, Center Height 8.3"-12.7"
Buy: $30.39 Leapers UTG Tactical Swat Bipod Rifle Rail Mount w/ Center Height 6.1"-7.9"
Buy: $69.95 UTG All-in-1 Range/Utility Go Bag, MOLLE Tactical Travel Pack, 21"x9"x8"
$54.95 UTG Recon Flex M-LOK Full Size Bipod Aircraft Aluminum Black Height 8.0"-11.8"
$37.86 Leapers UTG TL-BP98Q Super Duty Bi-pod with QD Lever Mount, Height 6.0"- 8.5"
$46.75 UTG Tactical Rubber Armored Full Metal QD Bipod Picatinny Mount Ht. 6.0"- 8.5"
$58.99 UTG TL-BP01 Rifle Tactical Aluminum Heavy Duty Recon 360 Bipod 6.69"-9.12"
$45.99 UTG Recon Flex KeyMod Bipod Aircraft Aluminum Matte Black Center Height 5.7"-8"
$39.95 UTG TL-BP99Q Super Duty Bi-pod with QD Lever Mount, Height 8.0"-12.8"
Buy: $22.9 UTG Leapers Tactical Rifle Single Point Bungee Sling Adjustable 42" to 58"
Buy: $52.7 UTG Recon Flex M-LOK Bipod Lightweight Aircraft Aluminum Matte Black Ht 8"-11.8"
Buy: $26.99 UTG Med Pro Shooters Bipod Picatinny Swivel Stud Quick Detach 6.2"-6.7"
Buy: $29.9 Leapers Hunting Rifle Barrel Clamp On 0.43"-0.75" Fold Bipod Adjustable 9"-11"
Buy: $25.0 UTG Tactical OP Bipod, Rubber Feet, Center Height 8.3"-12.7"
$54.95 UTG Recon Flex KeyMod Full Size Bipod Aircraft Aluminum Black Height 8.0"-11.8"
Buy: $24.85 Leapers Hunting Rifle Bipod Rubber Feet Picatinny Mount Steel Feet 8.2"-10.3"
Buy: $55.95 Rifle Tactical Heavy Duty Recon 360 Bipod Center Height Adjustable 8.12"-11.97"
Buy: $54.75 UTG Recon Flex Keymod Bipod Lightweight Aircraft Aluminum Matte Black 8"-11.8"
Buy: $27.65 UTG Tactical OP Bipod, Rubber Feet, Center Height 8.3"-12.7"